The digital trading becomes a trend for people around the world for the latest decade. Since the internet was found, the development of technology growing up significantly. For example, in a trading transaction. The definition of trading itself is the meeting of seller and buyer then they make a consensus, the seller gives the goods, and the buyer gives the money as of purchase — these transactions mostly 90% doing in the market. But, these definitions proceed in this era, because the meeting of seller and buyer doesn’t to be the most important point in trading. The people prefer to buy something via smartphone through the online market. There are lots of online markets that provide all the people necessary, start from food, electronic thing, cosmetics, fashion, etc. Exactly, this is the positive change that can’t be denied, and people should adapt to this change — the online shopping more effective and efficient, especially for the busy man. The mechanism of online shopping begins from the customer choose the things that they want to buy, then choose the payment method. The seller will receive the payment confirmation and send the customer order. The online shopping process isn’t always run well, sometimes the problems appear. Such as, unoriginally goods, the package does not deliver well, until the goods are lost during the shipping process — these problems making the customer disappointed and feeling the loss: three parties involved in the online market, the seller, logistics service, and consumer. Each party should be honest and doing the function properly. At least there are several reasons why the logistics company is having a problem. The logistics company still using the manual method in the filter the package, verify the number tracking, and using the paper document. These practices consume so much time and not effective to implement. If in a one day there are more than 1000 packages that should be verified, the worker will feel so tired and need lots of time. The consumer has the rights to know the position of their goods, is there any problems in the process, and get the information if their goods are lost or stolen. The logistics industry should update real information time. But the logistics ignore this job description. If this function ignored continuously, the transparent transaction would not be reached. If the accident occurs, where’s the party that should be responsible? The manufacturer or logistics industry? This is an important point that must be clear in the contract between them. How far the logistics burden the responsibility for certain cases, such as delay in delivering, the goods are stolen or may be lost. It must be clear and written in contract letter. This is the time for logistics to change their method from the manual into modern technic which utilizing the technology. The latest technology that relevant and adaptable for this case is blockchain technology. Blockchain becomes the solution for transportation and logistics problems. This technology can create secure and transparent transactions — the blockchain working as the modern revolution for supply chains. According to the data from World Economic Forum, the blockchain successfully improves the border administration up to $1 trillion trade. This condition gives a chance for developer companies to create the platform by utilizing the blockchain technology, but it’s not run as well as we think because for several platforms may take the high price for RFID chips, but not for EndChain. EndChain helps the logistics to improve their performance and help the manufacturer to get the best service from logistics. The percentage of sales for logistics cost are expensive. This condition becomes the burden for the producer. Then, the blockchain technology will reduce the cost through a smart contract. The blockchain facilitates the user to build the communication with another user in the same system. 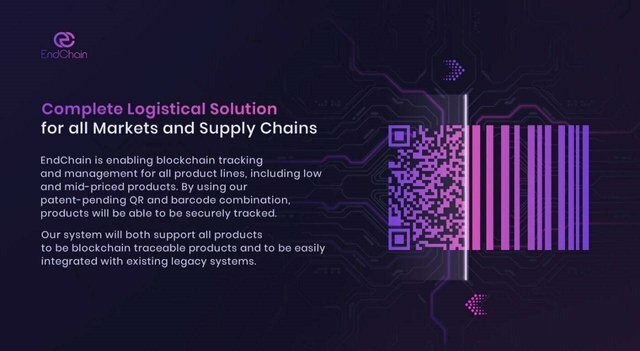 The unique feature from EndChain technology is the combination of barcode and QR system. This feature is beneficial for the logistics industry because the verification of the packages can be doing instantly. Besides that, the barcode and QR are possible to consume the ease cost. As explained before, the logistics industry still rely on the manual method. By using the EndChain which offering the conveniences for processing the packages, the logistics will save time. The workers will improve their productivity. Then, on each phase, the blockchain technology also able to decrease the concern of manufacturer for the supply chain. The blockchain technology was designed perfectly with the ability to build an efficient supply chain. Based on the report of KPMG, 37% of producer placing the supply chain failure bring out the huge risk. EndChain presents the solution to this problem. By using EndChain, the manufacturer can reduce the counterfeits and mismanagement of the supply chain. Besides it’s beneficial for the manufacturer, this program also gives the advantages to the consumer. The consumer will be protected from the unoriginal products. Before the packages are sending, all goods are scanned with barcode and QR code. It will minimize the counterfeits goods which harm the parties. The items that scanned will be moved to the boxes. Then, the code of the box will be scan. The codes are labeled on the packages. The code has the function as the identity and as the mark that the goods already registered. The code of item is same with the box code; it is work to connect the products with the outside code. The worker one scanner to scan all the box code. It’s not a matter, because of the scan machine connected with the system so that it won’t be false. EndChain ensures that the packages in good and safety condition. In transit place, the packages will be scan again to ensure there are no lost packages, stolen, or broken. On this phase, the consumer will get the update information about the location of their goods. If something bad happens, such as theft, the customer can decide to call up the police. The transit phase is essential for the manufacturer too. The manufacturer obliges to controlling the shipping process and make sure that the order is received on the right person. When the product has reached to the customer, it should be done by the customer itself to minimizing the work. To avoid the risk of worker error, the worker just having the assignment to scan the code of products. The products that already scanned must be registered in a blockchain and EndChain system. Because EndChain can’t work if the background of sale device itself doesn’t work. Not all the products having the barcode from EndChain, if there’s the product which unregistered by EndChain, the product will be differentiated automatically. The customer has the rights to reselling the products. For the second-hand goods, they unknown the originality of products and where are the products come from. So, the EndChain present to help the second-hand party to check the goods by scanning the barcode of these items. EndChain will detect the authentic of the products, the green check or cross red. This advantage is so beneficial for the second-hand user because it will avoid them to receive the counterfeits goods. EndChain makes the structure that covering all the parties that possible in one trading process, include reseller. The main job description of CEO is researching to find the innovation for the logistics problems. The CEO also work as the connector to the companies as the EndChain target. The CEO must be humble and having the ideas to solving the problem. The keen vision and mission will bring out the successful for EndChain. The CTO is focused on the supply chains and technology. He is trained as data science engineering. The CTO work to managing the system and the development of the feature, such as the barcode system. The CTO is responsible for ensure the secure data by user entry. The CTO also leads the developer team, the architecture of engineers and the data scientist. The business division has the central role to create a positive relationship between the company and clients. He responds to discussing, negotiating, and determine the payment gateway with the clients. The business development must have the capability in communication skill and influence the listener. Besides that, the business development also responsible to the financial fluctuation. The marketing division also crucial in a company. This division has the tasks to promote and give the education for people to get the interest from them. The marketing division is responsible for building a relationship with another party. Likes the investors, manufacturer, logistics industry, etc. He has to master about the EndChain program, the benefits, and the EndChain work. The EndChain teams are strong and high respect to each other. They make a fun atmosphere in working because their goals are the same. To be the solution of logistics problems. EndChain still seeks to complete our program to give comfortable and new experiences while shopping. EndChain was launched the unique feature is barcode and QR on August 2018 and will be launching the first token sale on December 2018. In the future, hopefully, EndChain able to create the independent application that contains lots of advantages for the public. We believe that we can present the best service for people around the world without changing their habit of using a smartphone. Wish the EndChain teams more solid and professional in the future.